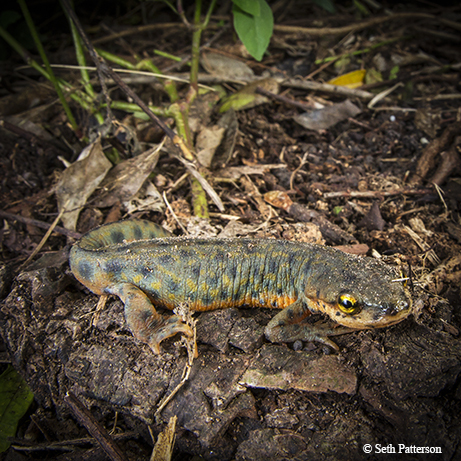 Shrinking habitat threatens the fierce black-spotted newt. While you wouldn’t want to be a creature smaller than one of these lions — er, newts — they are entirely harmless to humans. In fact, researchers have discovered that newts are good indicators of a healthy environment. Even when a black-spotted newt (Notophthalmus meridionalis) is right in front of you, it can be hard to see. With an olive-green back that is speckled with black spots (hence the name) and striped in gold, this tiny hunter blends convincingly with its surroundings.When camouflage fails to work against predators, the newt has a secret weapon in its arsenal: the unken reflex. The black-spotted newt can rear up to expose a bright orange underside, warning predators that it is toxic to eat. Black-spotted newts grow to a length of 3 to 4 inches, with drier skin and a more rugged lifestyle than their cousins, the salamanders. Dry scrubland surrounded by mesquite and cactus may sound like an amphibian’s nightmare, but low-lying areas like these can hold water and transform into busy ecosystems after a rainstorm. The newts’ life cycle is tied to these ephemeral aquatic environments. After heavy rains, newts quickly turn from voracious predators to amorous courters, seeking mates and submerged aquatic plants to lay eggs. Our orange-bellied native faces many threats, and in light of these, the black-spotted newt is listed as a threatened species in Texas and endangered in Mexico. Agricultural fields, asphalt and concrete now cover ephemeral ponds once used for breeding, so there are few places left for the newts to lay eggs. Once-continuous habitat is now fragmented, and worldwide epidemics of chytrid fungus and ranavirus have taken a heavy toll on amphibians. For those of us who live in the Rio Grande Valley, the black-spotted newt is a high-priority conservation species in our own backyard. Newts are sensitive to poor water quality and vegetation conditions, so a pond with newts is a healthy pond. Researchers from the University of Texas Rio Grande Valley, Gladys Porter Zoo and the San Antonio Zoo are currently studying population size, seasonal movements, reproduction and genetic relatedness. If you see a newt, please post it at www.inaturalist.org/projects/herps-of-texasor contact Richard Kline at richard.kline@utrgv.edu. Did You Know? Newts lay between 40 and 100 single eggs.